Tolentino rises at 224 meters of height on the left bank of the Chienti river in the territory of Macerata and not far away from the Park of the Sibillini Mounts. The territory of Tolentino turns out to be inhabited since the Paleolithic but it is with the Picens that can be dated the beginning of its recent history (VI sec. b.C.). Of this period have been recovered numerous tombs. With the battle of Sentino (295 a.C.) and the defeat of the Italic Union Tolentino passed under the infuence of Rome becoming Municipium with the name of Tolentinum. After a period of development in Imperial age the city was victim of the barbaric invasions and subjected before to the power of the Church that made of it a episcopal center and then to the Longobard Reign (752). Returned to the Roman Church after the invasion in Italy by the Franks, Tolentino flourished again in the XI century becoming free Comune (Municipality - XII sec.) and knowing a period of economic development. It passed therefore under the dominion of powerful nobles families as the Da Varano and the Sforza. Returned again under the administration of Rome, the city was the theatre of the advent of the Napoleoniche troops and their definitive defeat: in 1797 in fact was signed here the Treaty of Tolentino between Napoleon Bonaparte and Pio VI, dealt that imposed heavy custom offices to the Church and determined the end of the Papal State. 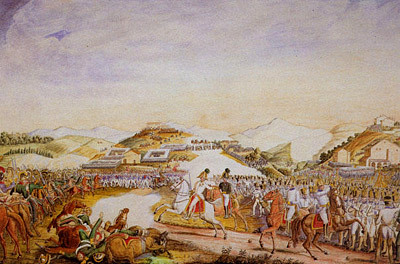 The Napoleonic parenthesis was closed in 1815 (2 and 3 May), when the troops of the king of Naples Gioacchino Murat, Napoleon's brother-in-law, fought and lost with the Austrians troops nearby the Rocca della Rancia (Rancia Fortress) decreeing the end of the French dominion and the re-anexation of Tolentino to the papal territory until the moment of the unification of Italy (1860). Tolentino distinguished itself during the Second World war in the fight against the Nazis becoming one of the Italian Cities decorated to the Military Valor during the Liberation War. Between monuments of Tolentino not to be missed a visit to the Basilica di San Nicola da Tolentino with Agostinian convent and Laurenzian library and to the beautiful Rancia's Castle, quadrangular shaped with town-walls with battlements and three angular towers, today seat of the Archaeological Museum.